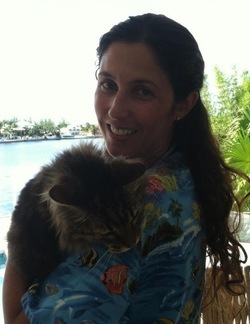 Dr. Berdugo is a small animal veterinarian making house calls in the lower Florida Keys. This includes visits to your home, business, or boat. Her practice has been in operation since 2005. She is a 2001 graduate of Ross University School of Veterinary Medicine. She received her Chinese Acupuncture certification from the Chi Institute in Gainesville, Fl. and completed her Animal Rehabilitation training at the Canine Rehabilitation Institute in Loxahatchee, Fl. She is a member of the AVMA, FVMA, FKVMA, and AHVMA. Dr. Berdugo's practice has taught her that the best and most comprehensive treatment plan integrates both conventional and alternative modalities. Longer consult/exam time (up to an hour)- This allows a more comprehensive visit. Stress free! A calmer & happier pet waits at home instead of a noisy animal hospital full of germs. Save money in terms of travel & time away from work.